Dr Jane Ladlow, Andrew Higgins of the Kennel Club Charitable Trust, Dr David Sargan, Dr Nai-Chieh Liu and Hector Heathcote of the Kennel Club Board. 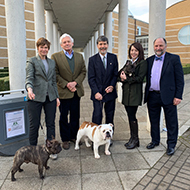 The University of Cambridge and the Kennel Club Charitable Trust has launched a new health screening scheme for French bulldogs, pugs and bulldogs. The Respiratory Function Grading Scheme tests for the presence and severity of Brachycephalic Obstructive Airway Syndrome (BOAS). It aims to give breeders a means to know more about the health of their dogs and provides the information they need to cut the risk of breeding puppies with BOAS. The assessment can be carried out by a number of specially-trained assessors across the UK and involves listening to dogs airways before and after an exercise tolerance test. The assessors then use a pre-defined protocol to grade the dogs 0-3. Dogs graded zero are free of the respiratory signs of BOAS, while dogs graded three show severe respiratory signs. The scheme also issues guidance that dogs graded three should not be bred from. For Kennel Club registered dogs, the grades would be recorded on the Kennel Club’s database and published in the Breed Records Supplement, on the dog’s registration certificate, and on the Kennel Club Health Test Results Finder and Health webpages. Furthermore, the scheme is supported by guidelines for breeders, to help them understand the grade for their dogs in terms of risk when considering potential matings. Speaking at the launch event in Cambridge, Kennel Club senior health and welfare manager Bill Lambert said: “The high demand for these breeds, combined with the already recognised health problems has made brachycephalic health and welfare one of the most pressing canine issues in the UK, and one of the Kennel Club’s top priorities. The move has been welcomed by Brachycephalic working Group chairman Dan O’ Neill, who said the scheme is a ‘positive step’ towards improving the care of affected dogs, and the health of future generations. “The scheme is a practical, accessible and evidence-based tool that we would urge anyone who breeds pugs, bulldogs or French bulldogs to use to help to reduce the breathing problems these breeds can face, which is a shared goal of everyone who cares about dogs and their health and welfare,” he said.